E-Fix electrical add-on drives combine the benefits of both power and manual wheelchairs. 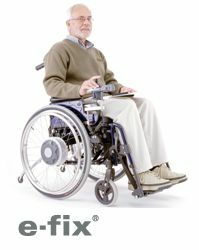 Almost all wheelchairs can be fitted with e-fix and it is simple and easy to use. The compact components are quick to release and can be transported without difficulty. The high tech hand control unit provides full power and direction control, 'on-the-spot' rotation and a max speed of 3.7 mph, with up to 12.42 miles range.